SAN FRANCISCO -- The size and inside might of the Los Angeles Clippers proved too much for the Golden State Warriors Thursday night at the Oracle Arena in Oakland. Blake Griffin muscled his way to 32 points and 8 boards while DeAndre Jordan peeled 22 rebounds to go with his 14 points and the Clippers took Game 3 of their Western Conference quarterfinals, 98-96. Griffin was nearly unstoppable in the low post, punishing his defenders by swishing 15 of his 25 field goals. Without 7-foot center Andrew Bogut, Griffin took advantage of the Warriors' lack of a rim protector and scored 10 in a row in the third period. It was the Clippers' second win after dropping Game 1 at Staples Center. They now lead the best-of-7 series 2-1. Game 4 is Sunday afternoon (Monday AM in Manila) at the Oracle Arena. Behind by 18 midway through the third quarter, the Warriors waged a furious rally that put them to within 98-96 with 8.6 seconds to go. But Stephen Curry's desperation fell short, allowing Los Angeles to narrowly escape with the victory. 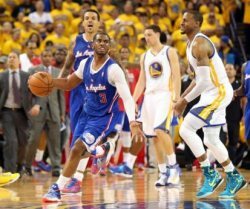 Photo: Chris Paul (L) and the Clippers skated narrowly escaped the Golden State Warriors, 98-96, Thursday night at the Oracle Arena in Oakland.